The Ekiti State Governor, Ayodele Fayose, has said President Muhammadu Buhari was becoming an embarrassment to Nigerians, urging his handlers to desist from allowing him to speak extempore. Fayose said this in reaction to the President’s claim that former Libyan leader, Muammar Gaddafi, should be blamed for the ongoing herdsmen killings across the country. According to a statement issued on Thursday by his Special Assistant on Public Communications and New Media, Lere Olayinka, the governor said it was becoming obvious that “very soon, President Buhari will blame those who elected him for his failure”. While meeting with the Archbishop of Canterbury, Justin Welby, in London on Wednesday, President Buhari had said the arms Gaddafi, who was killed seven years ago, provided to his supporters had filtered into Nigeria, where they are now being used to fuel killings. He said: “Nigerians are accusing President Buhari and his government of complicity in the herdsmen killings and all that the President could do in response is to blame Gaddafi, who became history seven years ago? This is no doubt another international embarrassment from a President who knows nothing other than to blame people for his own failure. “Methinks those handling the President should see to it the he is prevented from speaking outside Nigeria without a prepared speech. 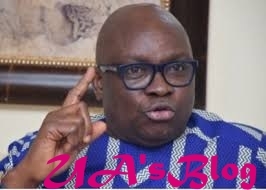 Fayose said Buhari should rather face the reality of his government’s failure to secure the lives and properties of Nigerians as well as its seeming culpability in the herdsmen killings instead of going to foreign lands to advertise his cluelessness by blaming the dead.